Packaging Machines, Packaging Materials, Continuous Band Sealers, Band Sealer With Air Filling, Hand Portable Impulse Sealers, Pedal Impulse Sealers, Vacuum Packing Machines, Heavy Duty Semi Automatic Strapping Machines, Fully Automatic Strapping Machines, Shrink Packing Machines, Shape Bag Filling Machines, Automatic Shape Bag Filling Machines. 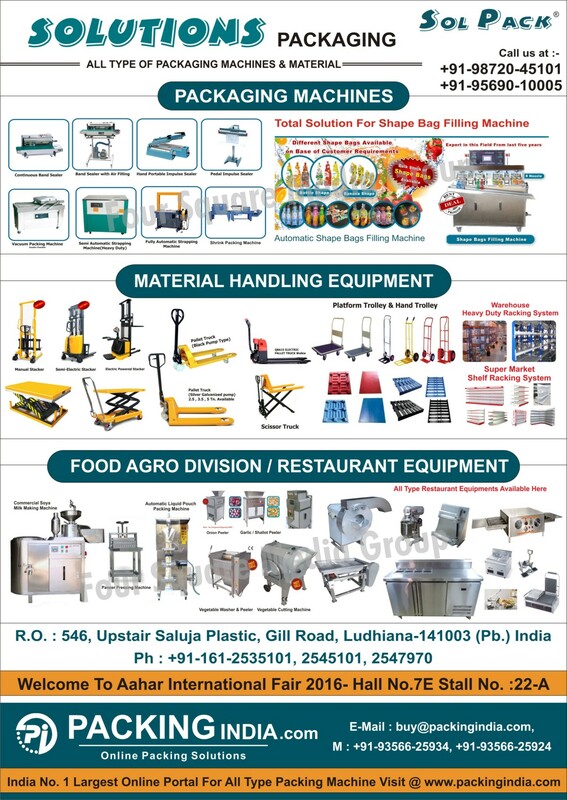 Material Handling Equipments, Manual Stackers, Semi Electric Stackers, Electric Powered Stackers, Black Pump Type Pallet Trucks, Electric Pallet Truck Walkie, Silver Galvanized Pump Pallet Trucks, Scissor Trucks, Platform Trolley, Hand Trolley, Warehouse Heavy Duty Racking Systems, Super Market Shelf Racking Systems, Food Agro Division Equipments, Food Restaurant Equipments, Commercial Soya Milk Making Machines, Automatic Liquid Pouch Packing Machines, Onion Peelers, Onion Peeling Machines, Garlic Peeler, Garlic Peeling Machines, Shallot Peeler, Shallot Peeling Machines, Paneer Pressing Machines, Vegetable Washer, Vegetable Cutting Machines, Vegetable Peeler, Vegetable Peeling Machines, Vegetable Cutting Machines, Restaurant Equipments, Ice Cream Pouches, Plain Laminated Pouches, Printed Laminated Pouches, Racks as an active Manufacturer, Supplier, Dealer, Distributor, Trader and Seller etc. (*Importer/Exporter/Service Provider).